Several months ago, a friend upgraded from his 1987 Cutlass to a (drum roll please) top-of-the-line 2018 Honda Civic. Not being the most tech-savvy of people, he took me out for a ride in his new ride, hoping to learn a few things about all the flashing lights surrounding him. It’s a good reminder of how technology has been evolving through the 90s, 2000s and 2010s. And this evolution shows no signs of slowing down. 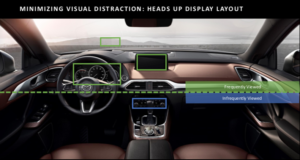 It makes sense to minimize each type of distraction, thus keeping vehicle occupants safer. Mazda explained its control and information layout using a number of other slides. I’ll show three more of them here. I hadn’t realized this before, but Mazda does keep driving information in front of the driver and other readouts off to the right. That’s not the case with all automakers. For example, when a vehicle offers “Sport mode” the centre screen may show things like boost gauges. I don’t want to look down when I look for information that I want at a glance. That explains both the segmentation in the following graphic and how things like gauges are designed. 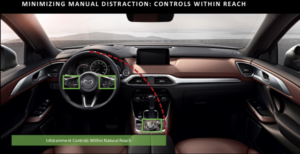 Besides having a layout that’s easy to navigate by touch alone, the controls are mostly within easy reach. 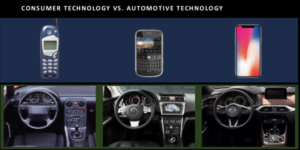 I have reached forward to touch the touchscreen (I dialled a phone number, which I cold have done using Mazda’s HMI controller) but aside from that, this graphic shows my experience in Mazdas. How do other vehicles stack up? The quick answer: it varies. I have noticed (though disregarded) how I have stretched in the past to reach touchscreens. I also haven’t always gotten along with touchpads or the system layout. Mazda is a case in point: I’m looking forward to Apple CarPlay’s arrival in future Mazdas, since the Mazda Connect on-screen system does not make it easy to access music, audiobooks or other resources on my phone. Don’t get me wrong. I like driving Mazdas. But even its representatives admit they are always striving for improvement. Let’s dwell on that last point. Have you driven vehicles in which supplementary systems like infotainment proved easy to use (or the opposite)? Let me know in the comments below.